The presidential candidates talk a lot about how they'll bring jobs back and restore the nation's once-mighty manufacturing sector. Jason Kester has been trying to do that every day for more than three years. As executive director of the Southern Ohio Port Authority, Kester is charged with spurring economic development in Scioto County, Ohio. The county, which sits just across the Ohio River from Kentucky, was a thriving manufacturing hub decades ago, but its industries and many of its remaining factories are mere shells of their former selves. The area lost thousands of jobs -- and residents -- as companies closed or moved operations overseas. Businesses continue to downsize, leaving Scioto County with a 8.8% unemployment rate. Kester is not deterred. 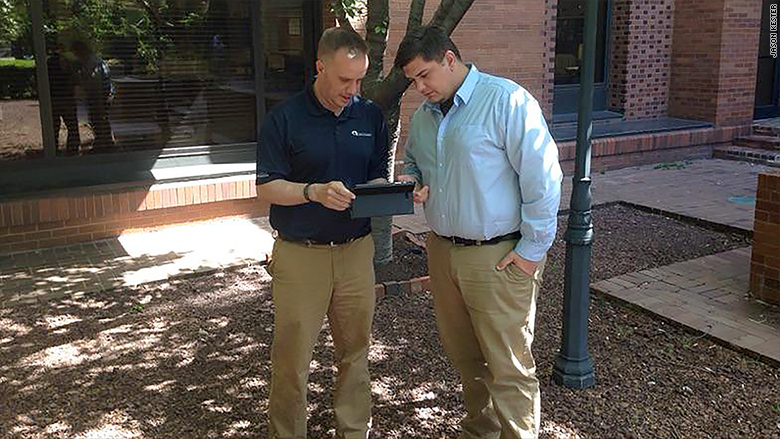 He, along with his counterparts in three neighboring counties, are actively recruiting companies by showcasing their central location, experienced workforce, low tax burden and proximity to railroads, highways and the river. They prominently point out on their joint website that the cost of living and median wages are below both Ohio and national rates. Also, they are trying to grow local and regional manufacturers and companies that are already familiar with the area. "They are already married to us. They know what's going on," Kester said. "It's easier to work with them." Kester says he'd rather attract 20 businesses employing 50 people each than a single large manufacturer with 1,000 workers. That way, if one shuts down, it's not crippling to the local economy. Jason Kester, left, and Adam Phillips, both of the Southern Ohio Port Authority, work to bring companies to Scioto County. The team has had some successes recently. More than two dozen companies have opened shop or expanded in the four-county region since 2013, creating 745 new jobs and bringing nearly $150 million in new investments, according to data from the Joint Economic Development Initiative of Southern Ohio. That's more growth than the area had seen in prior years. Still, it's not likely the big steel companies and heavy chemical plants that once powered the local economy will come back, Kester said. "We have to find whatever that next generation of industry is that works with our strengths," he said. "It's very challenging." Also, Kester must contend with the fact that companies can pay workers much less overseas. He recently visited factories that create computer chips and medical devices in Mexico. Workers there make $7,000 a year and the company provides breakfast and lunch, he was told. "How do you compete with that?" he said. Another hurdle is finding a place suitable for potential employers. Only one site in the four-county region has natural gas, sewer and water lines, electricity and fiber optics capacity already built in. Some of the former industrial sites have been turned into two Walmarts and a Kmart. Still, some companies want to be in the U.S., and Kester wants to make sure they consider Southern Ohio. Luring Infra-Metals to Scioto County was a big win for the area. 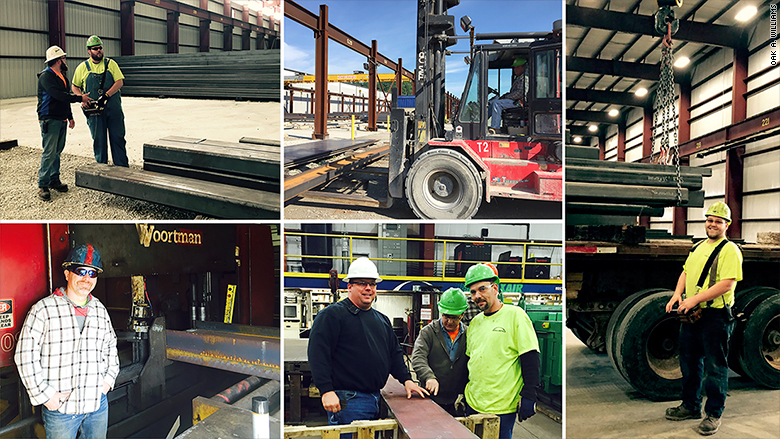 The steel service center -- a Connecticut-based firm that stores and prepares the metal for fabricators and manufacturers -- was looking for a Midwest location to be closer to customers. It picked a former steel mill factory, where it could build a dock for barges on the river and a rail spur connecting it to the Norfolk Southern line, lowering the costs of getting steel to the site, said Oak Williams, general manager of the company's Scioto outpost. "If you look at a map, this is ground zero for access to all those locations," said Williams. But it still took four years to clean up the site and bring in gas lines, he said. Infra-Metals, a steel service center, opened its doors in 2013. Infra-Metals opened in late 2013 with 24 workers and now has 70 on its payroll, most of whom have no more than a high school education. It hopes to grow north of 100 people if the national economy remains strong and investment in construction and infrastructure continues. Starting pay is $12.75 an hour, but workers can earn more than $40,000 a year when a profit-sharing program is factored in. Though Infra-Metals operates in a 280,000-square-foot facility on 50 acres, its business doesn't require as many workers as its predecessor on the site. The steel mill, which operated from 1828 to 1980, employed as many as 6,000 workers in its heyday in the middle of the last century. "You just don't need as many hands to get the job done," he said. Related: Is trade really killing middle class jobs? Other companies opt to open up shop in Scioto County out of loyalty to their community. And, by keeping production in the U.S., they can keep a closer eye on quality and in better touch with customers, they say. Appalachian Wood Floors is one homegrown business that's expanding swiftly. Launched 15 years ago in a former brick factory, the firm makes up to 60,000-square-feet of flooring -- enough for 40 houses -- a day. Its staffing has swelled from 10 people to 120 today, and it plans to add another 20 when it expands its manufacturing operations into a new building. Workers start at $9 an hour. The Graf family, which owns the company, are longtime residents of the area and have worked with wood for three generations. Robert Graf ran a saw mill in the mid-1900s, taking advantage of the surrounding Appalachian hardwoods. Two of his sons operate a lumber mill in nearby Kentucky, while another son and grandson oversee the flooring factory in Portsmouth, the county seat of Scioto. Appalachian Wood Floors is run by longtime Scioto County, Ohio, residents. 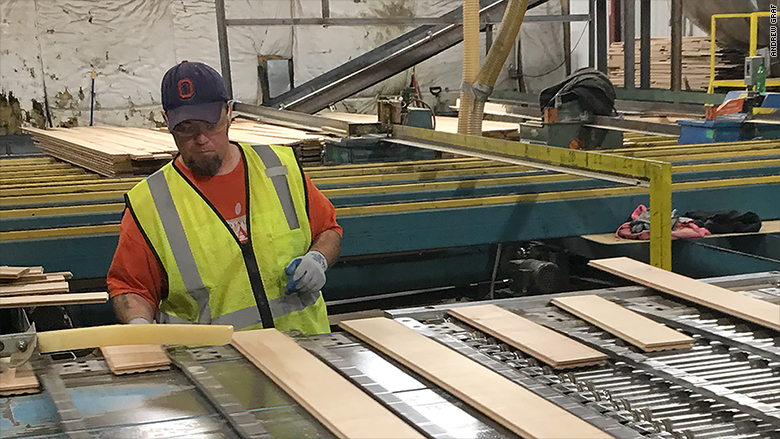 Appalachian Wood Floors doesn't try to compete with cheaper imports, said Andrew Graf, president and one of the third-generation family members in the business. It has found a niche in the high-end market, catering to both residential and commercial customers. Not only is it possible to revive manufacturing in the U.S., it's essential for the nation's economy and communities, said Graf, 33. He has witnessed the fallout from corporate disinvestment. Most of his high school classmates went away to college and never came back because there was nothing for them in Scioto. "It's our generation's responsibility to create what was here once before and give the people the opportunity to stay here," he said. "What got lost is the sense that we also have a duty to the people who helped us build the companies, not just cut them a paycheck and move on because we figured out we can save one-tenth of 1% by moving to Mexico or wherever."